This year was my 3rd straight year attending the Ohio Appalachian Collaborative regional convening of Elevating and Celebrating Effective Teachers and Teaching (ECET2). I have been honored to be invited to present breakout sessions at each of the events. This year’s convening was once again held at the beautiful Salt Fork State Park Lodge, near Cambridge, Ohio. ECET2 is special for several reasons. The premise for the event is, as the title suggests, celebratory. The ECET2 format prides itself on opportunities for teachers to learn from colleagues, and that is the “secret sauce” for ECET2. What did I take away from the 2016 Ohio Appalachian Collaborative ECET2? “because i said i would” – Our opening keynote was from Amanda Messer, CTO of because i said i would, an “international social movement and nonprofit dedicated to the betterment of humanity through promises made and kept”. Amanda did two important things: 1) She reminded us that we are, first and foremost, humans who are designed for relationships and interdependencies; and 2) She modeled vulnerability (and the opportunities for growth it brings) when those relationships and interdependencies spit in our collective face. Teaching is, after all, about relationships – with our students, with our colleagues, and with our communities. At the heart of every meaningful relationship is a factor of trust, and personal responsibility for one’s own word is at the atomic level for building that. Many years ago, I read Steven Covey’s “Speed of Trust” as part of a work-based book study. I enjoyed the book, but I kept finding myself getting knocked off-balance by what felt like relegating trustworthiness to “means” status, rather than “end” status. In other words, if “being trustworthy” is your strategy for increasing market share, or profits, or stakeholder dividends, you’ve already lost sight of the real reason for being trustworthy, and you’ll abandon it when it doesn’t feel like (or when the data suggest it no longer to be) the most productive option. “because i said so” restores that simplicity and genuineness to the power of a kept promise. Watch Alex Sheen’s TEDx Talk. Colleague Circles – As I tweeted to one of the participants this year, Colleague Circles are “the most dangerous, and the most valuable” part of ECET2. At other types of conferences, learning from colleagues happens in the margins. Some participants have learned to seek those interactions out and harness them. But at ECET2, significant formal time is set aside for participants to gather in small groups to discuss pertinent questions and reflect on what they have learned so far. Building these relationships, and sustaining them through the use of communications technologies like a shared CMS, social media like Twitter, or even just good old-fashioned e-mail, keeps the fire burning to put into practice what has been learned. Problem-based Learning – For my second presentation of the event, I wanted to model an innovative strategy that teachers could take and use in their classrooms. Back in May, I was introduced to BreakoutEDU by my new boss, Katie Siemer. BreakoutEDU replicates the “Escape Room” experience without actually locking anyone in a room. Our workshop participants had thirty minutes to decipher the clues and unlock the box. They did so with about 5 minutes remaining! BreakoutEDU is a great example of “The Ill-Defined Problem,” in which participants are actually given as little information and direction as possible, and are then allowed to interact and collaborate on their own to come up with possible courses of action and try them to find out what works and what doesn’t. This type of learning often feels messy, disorderly, slow, and risky. Learning that really sticks is usually all of those things. Animals, Artifacts, and Archery! – A regional convening of ECET2 has the advantage of incorporating local interests for the participants. 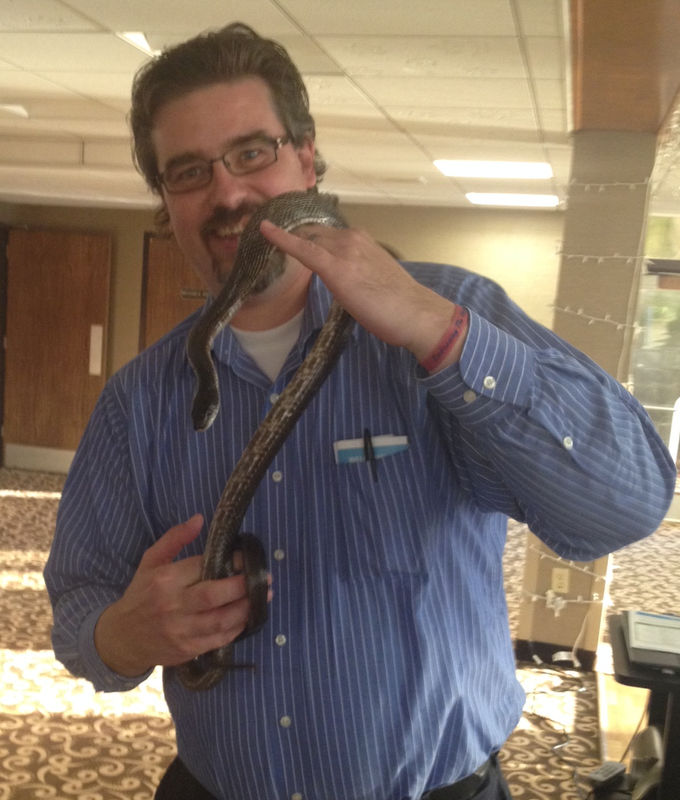 Two years ago, Ohio State Parks Naturalist John Hickenbottom was at the inaugural ECET2 at Burr Oak State Park, and he brought along a rat snake that I got to hold! On Monday morning at this year’s ECET2, John was at Salt Fork along with a large display of animal artifacts, some live animals, and some nature-based educational resources. It was great reconnecting with John and talking with him. He loves his work, and he’s very good at it – much like the teachers attending the conference with me. In the same space where John was talking about the animal artifacts, there was an indoor archery setup, called SAFE Archery. I haven’t shot a bow in ages, and I really wasn’t sure I’d know how. But, I was fairly convinced I wouldn’t do much damage from the seven-foot range we were shooting plastic balls hovering on a column of air. So, I stepped up. Bam! Four for four! If I ever have to hunt plastic balls with foam-headed arrows for food, I won’t starve! The world is really a pretty small place sometimes. One of the organizers for OAC ECET2 in 2014 is a rockstar teacher named Sara Beardsley. I have known Sara since we were kids, but neither of us figured that out until after I showed up at Burr Oak to register for that inaugural event. The next school year, Ms. Beardsley wanted to conduct a book study with her class using the book “A Path Appears”, but she didn’t have access to enough copies for her entire class. So, she did what any 21st Century teacher might do… she crowdsourced it! As one of the contributors, I received a collection of original (not photocopied) thank-you notes from the students, many of them hand-written. I have carried those thank-yous in my backpack with me ever since, and anytime I am having a pretty rough day, I pull them out and read through them. It doesn’t take long for me to remember more important things than whatever temporary ill has befallen. One of Ms. Beardsley’s colleagues, Mr. French, was one of the organizers this year, and I was more than happy to show him the collection of thank-you notes. He knew each of those students personally as well, and we had a great time looking through them over breakfast. The book and the project hopefully made a lasting difference in those students’ lives. Their kindness to me has made quite a difference in mine. I have posted blog articles with my reflections on the 2014 and 2015 convenings previously. [2014 ECET2] [2015 ECET2] If you would like to bring an experience like this to teachers in your region, check out the National ECET2 site for more information. This year, I have the pleasure of attending my first-ever ISTE conference, thanks to the good folks at my new workplace, Forward Edge. I also have the added privilege of giving two presentations! My “Five Rules of Design Thinking to Reach All Students” presentation was accepted as part of “ISTE Ignite Sessions – Round 1” on Sunday, June 26 at 1:30 PM (MDT, 3:30 PM EDT). The Ignite format means I have prepared 20 slides, and they will auto-advance every 15 seconds, giving me a grand total of five minutes for my presentation. I’ve done versions of my “Five Rules” work in lots of different time blocks (fifteen minute TEDx, one hour, two hour, all-day ), but this will be my first time doing it in the five-minute Ignite format. As difficult as that sounds, it’s all about the preparation, and being settled on just exactly what I want to say for each of my slides, and “sticking to the script”. Then, I will team up with my friend Stacy Hawthorne to be part of a forum session titled “Making Ed Tech Stick!” Multiple presenters will again have five minutes each to talk about proven strategies that have helped schools use educational technology to truly transform the way we teach. My presentation there will be titled “Three Big Fat Lies Tech Coordinators Tell”. Two presentations. Ten minutes. And lots of opportunity to enjoy and learn from others’ presentations along with mine! Will you be at ISTE? Or perhaps you will be part of the #NotAtISTE16 crowd? Either way, I look forward to learning from the overwhelming amount of interaction that comes out of this conference every year! Learn more about the Ignite format, and see some great Ignite talks at their website, IgniteTalks.io. If you missed TEDxWorthington, the Livestream recordings provided by WOSU are still available. The event was broken down into three sessions. Visit the event archive on Livestream to access these videos. I have previously submitted proposals to speak at TEDx events in Cincinnati, Dayton, Columbus, and Kalamazoo. Every time, I have been told there was a large volume of great ideas, and my proposal happened not to be selected. Fifth time was the charm. My presentation proposal has been accepted for the TEDx Worthington event on Saturday, February 27, 2016. The event will take place at the McConnell Arts Center at Worthington High School. The theme for the event is “Resolve”. As I prepare for this event, I thought I would put together a list of my ten favorite TED/TEDx talks, to remind me of what I like most about the format and give me some pointers on what I can do with my 12-15 minutes. Sir Ken Robinson – Do schools kill creativity? Every so often, it is good to have a reminder of why I do what I do. I had the distinct honor of being invited to participate in the second OAC ECET2 convening. I love doing presentations for teachers, but I also love the informal opportunities to sit down with educators and talk to them about what is going well and what they struggle with. The ECET2 style is extremely possible to replicate, and could be used so much more widely to encourage teachers to do awesome things for kids. Look into it, and think about exploring it for your school if you’re tired of professional development opportunities that don’t meet real needs and never last. Take a look at “Bringing ECET2 Home” for some resources and tips from the OAC ECET2 organizers! I want a drone! At the end of the convening, all of the attendees went out to a hillside for a “group photo”. The photographer took a couple of standard shots with his camera, but then out came the drone. After a few flyovers, we were done with photos, and I went up to the operator to ask him about the device. He was very enthusiastic to tell me about his drone and how well it works, showing me how it connects to his phone to control the drone and store video from the camera. I want a drone. Marshmallows, spaghetti, string, and tape are amazingly effective teaching tools. I ran a “Marshmallow Challenge” during one of the breakout sessions. I always love doing this and seeing the impact it makes on teachers reflecting on their work. I love it even more when I see one of my participants on Twitter the next week running the same challenge with a classroom of their students! There is a big focus on keeping teachers in the classroom as much as possible. This conference was even scheduled on a Sunday and Monday to help reduce the amount of time the teachers would have to be out of the classroom in order to participate. I understand the basis for this idea, but sometimes I fear that the philosophy is doing more harm than good. There is a popular quote misattributed to Abraham Lincoln that says “if I had six hours to chop down a tree, I would spend the first four sharpening my axe.” I want my kids’ teachers to be at their best, with lots of great ideas to try and plenty of enthusiasm for the work. If that means letting them out of the classroom more often, so be it. My kids would rather have a great, enthusiastic teacher four days a week than a teacher who goes through the motions every day. I never know what thing I plan to say will resonate most with my audience. This one usually gets a lot of nods and smiles, and ECET2 was no exception. I use it in a lot of my presentations. It’s true, and it fits so much of the work that I do. Continue big thanks to my friend Greg Wilson for introducing it to me years ago. Reaching all students is an enormous task. We must never lose our perspective on just how enormous and important a task it is. It can all seem very overwhelming at times. But, a few lessons from things like marshmallows, an axe, and lettuce – as well as some time to discuss and reflect with colleagues – can go a long way towards providing the sustaining energy needed to be the awesome influence every kid is looking for. Read the Storify archive of the #ecet2oh hashtag during OAC ECET2! In October of 2014, I had the unique opportunity and distinct privilege of presenting my “Five Rules of Design Thinking to Reach All Students” workshop as a breakout session at the Ohio Appalachian Collaborative ECET2 Conference. I reflected on the event in an earlier blog post. The organizers also put together a great video describing the event. I am honored to announce that the organizers of this year’s OAC ECET2 have contacted me about attending and presenting at this year’s event! I will again be presenting my “Five Rules of Design Thinking to Reach All Students” breakout session. I have not seen the final schedule yet, but I believe I will be presenting it once on Sunday and then again on Monday. I love doing presentations like this, and I love being with educators and hearing them talk about their successes and their struggles. Also this year, I have the privilege of hosting a Design Challenge, which will probably take place on Monday morning. That reminds me, I need to add marshmallows to my grocery list…. Several months ago, I got an e-mail out-of-the-blue asking me if I would be willing to present at an education conference here in Ohio. I wondered if this was someone who had been to a session I led at a previous conference, or maybe someone who knew someone who had. I was wrong on all counts. The organizers of ECET2-OAC (What is ECET2? What is OAC?) did what anyone does these days when they are looking for something – they Googled. My “Five Rules” workshop was unique, it was timely, and I had one other secret ingredient – I live in Ohio, under three hours from the conference site! So, plans were made, and I embarked on a trip to Burr Oak State Park, not knowing if I would even know anyone there! But the concept of the event was just so different, I had to see what it would be like. What I found exceeded my highest expectations! Here are some of my highlights from attending ECET2-OAC on October 29-30, 2014. Dr. Irvin Scott. – Dr. Scott provided the opening keynote. He is theDeputy Director for effective teaching in the educational division of the Bill & Melinda Gates Foundation, and is “the guy” when it comes to the whole ECET2 phenomenon. His story is a testimony to the power of teachers who have high expectations and who are willing to give their students supportive, safe environments to reach beyond what they knew they could accomplish. Hear him talk. Follow him on Twitter. Colleague Circles – A unique aspect of the ECET2 conference was the Colleague Circles. While I did not directly participate in any of these, they were organized to be a meaningful time for educators from the same building/district to discuss pressing issues with a guided format. The format led each team to come to some clear and definite decisions about how their practice will change going forward, and how they can be a positive force for change in their school. Snakes! – Even though technology, especially social media, has made the globe a more connected place, we are still very different in the places we come from. Being at a state park in Ohio has its advantages; a serene environment, great spaces to connect, and a ranger who lives for the thrill of putting snakes in the hands of visitors! A Bluegrass Band – For conferences like this, some of the best conversations can happen in the informal settings beyond the “scheduled agenda”. In this case, the evening’s entertainment was provided by a local bluegrass band! Not only was their music excellent, they spent a little time telling us about how they hand-made their instruments! Lots of new Twitter friends! – One undercurrent to the conference was an emphasis on encouraging educators to try out Twitter as a way of connecting with other educators outside one’s typical network. Here are some of them: Irvin Scott, Tracy Spires, James Herman, Will Sheets, Derek Hinkle, Melissa Sheets, Connie Cunningham, and Sara Beardsley! Also, check out the OACTeach Chat hashtag (#OACTeach) on Twitter! New Perspectives – One of my favorite parts of presenting “Five Rules of Design Thinking to Reach All Students” is hearing what the workshop participants do with the material. I feel like I’m doing a good job as a presenter when I learn something new from the workshop. Modeling the process of being a “facilitator of learning” rather than being a “gatekeeper of facts” is important for me when I present to teachers. The ECET2 “conference model” is intentionally different. It blends some aspects of traditional conferences with some of the “grass roots” level appeal of EdCamp. The result was a fun, informative, and eventful time spent by teaches, for teachers, and with teachers. When teachers spend time out of the classroom, this is an effective way to spend that time.